This keyless remote programming instructions work for L,U,REARGLASS,P remote with part # 95430-3E420 and FCC id PLNBONTEC-T016 on the back of it. 1. Using a suitable jumper wire, connect terminal 12 and 11 of the diagnostic connector located in the engine compartment adjacent to the battery. It usually has a plastic dust cover on it. 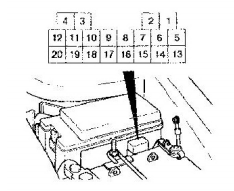 Note: On some vehicles the diagnostic connector is rotated 180 degrees. 3. If programming only one remote, press the LOCK button on the first remote until the turn signal lamps flash twice. 4. If programming two remotes, press the LOCK button on the first remote for one second (until the turn signals flash once) and release, then press the LOCK button on the second remote for one second (until the turn signals flash a second time) and release. 5. Turn the ignition to OFF and pull the key out.